I wasn’t at Hillsborough that day, though I’d thought of going, my first football match in years, to watch my team, perhaps meet up with my brothers, like old times. Instead I was standing in our kitchen just the other side of the valley, wondering what was going on, why they weren’t playing football. I’d have known little more had I been there – I would have been a football pitch away from the people dying behind the goal, and I would have been frustrated at the delays, and angry with the troublemakers. Instead I was watching and listening all that afternoon and evening as grief and horror and disbelief mounted. I wasn’t there that day but I remember afternoons in the Trent End, when a surge from the back of the crowd forced me stumbling forwards, feeling very small and vulnerable, trying to keep my footing, or pressed against a barrier till my ribs were bruised, and I can imagine so easily how it happened. I can understand after so many other games ruined in those days by people who cared more about fighting than football, some of the cumulative, and catastrophic errors in planning, in crowd management, in communication, in emergency response. But I can’t understand how long it took to see that there were people dying, how the pleas and desperate cries could have been ignored, for so long. And I can’t understand why the injured and the survivors and the families desperately searching for their sons and daughters and partners were treated as criminals, why information was withheld from them, why misinformation was wilfully disseminated (and not just by The Sun). I can’t understand why, still, after the Taylor report, and all of the information we now have in the public domain, the old lies about drunk and/or ticketless fans being to blame are still trotted out, every time that day is discussed. I’m not naive enough to believe that everyone at the Liverpool end behaved impeccably – some may well have had a drink or several, some may well have headed across the Pennines hoping to get a ticket when they got here, or to get in without. But actually, that’s by the by. Because the awful truth is that no matter how many of those fans were drunk and how many were there without tickets, if there had been stewards in front of the entrances to the Leppings Lane pens, directing fans away from the already crowded central pen, then no one would have died. No one. It’s horrifically, tragically, simple. Taylor called this a ‘blunder of the first magnitude’. From this blunder stemmed the desperate attempts by South Yorkshire Police to cover their own backs, to blame the fans, to propagate distortions and falsehoods that would persuade the public that what we had here was yet another example of football hooliganism, rather than a terrible error by those in authority. That’s why, despite the regular calls for the victims’ families to ‘move on’ and ‘let it go’ (clichés favoured in general by those who have not experienced anything approaching this degree of trauma ), there is still a need for information to be brought into the public domain, for light to be shed and records to be set straight. If there had been a swift acknowledgement that a hideous mistake had been made, and the energies of the authorities had been channeled with as much vigour into helping both the victims and their families as they were into blaming them, then the families would be grieving rather than campaigning, commemorating the ones they’d lost rather than fighting for the truth to be told and the lies to be nailed once and for all. 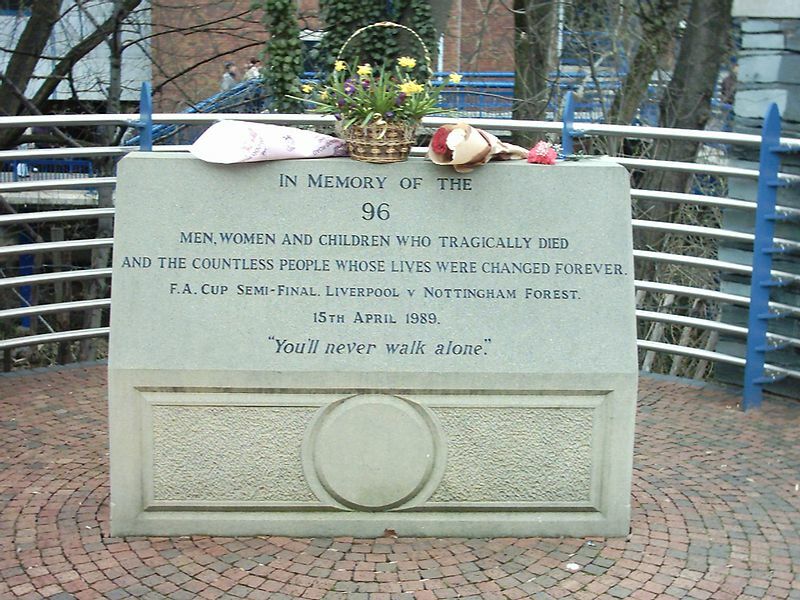 That afternoon twenty-three years ago is vivid in my memory, and I’m thinking as I do each year of all the people who never came home from that match, and all the people who waited for someone who never came home, and all the people who still live with that horror. You’ll never walk alone . This entry was posted on April 14, 2012, 7:19 pm and is filed under Football. You can follow any responses to this entry through RSS 2.0. You can leave a response, or trackback from your own site.